An UAV has been shot down in Georgian sovereign skies and the Georgian Army scrambles to secure the pieces from infiltrating Abkhazian militias. First to make contact with the Abkhazians, a Georgian Army squad with a lot of determination. This #11 episode will be from ArmA 2 gameplay, modded with the Georgian Armed Forces package. Tactical SITREP and mission. 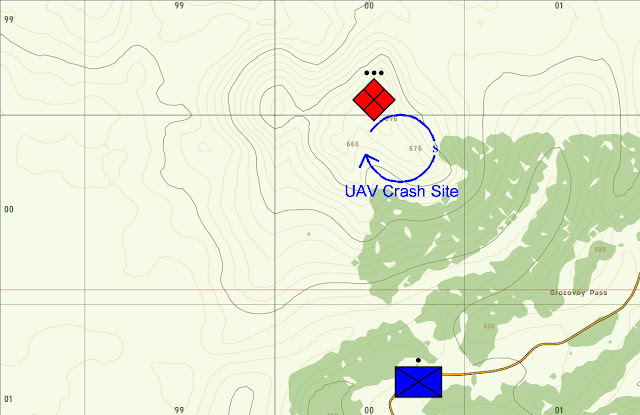 The Georgian Army squad (blue icon) has to secure the crash site. A mix of Abkhazian militia and regulars (platoon size) are known to have crossed the border and likely to be around the crash site. Lt. Jaba Chkhetidze, in charge of a border patrol detachment, faces a daunting task. Pictured here with the handful of HMMWVs that he used as transport. The smoke billow (far background) made it very easy to locate the objective. hi I am new to your blog. I must say I love it, I normally play with models (as can be seen from my blog) but I love games/simulators, and I decided to get the Arma 2 free version as soon as I saw this post... if I like it I might get the full version. sorry for boring you with talk of models, but I am new so I'll soon find my place. p.s got the free version because I am dirt poor is there other free or cheap games/simulators you can recommend for me? Gowan, if you're into flight sims try DSC World. It's a free download with Su-25T attack aircraft. With other purchasable mods, it becomes one of the best air-land combat sims ever. JC posts lots of stuff using that sim. Mehmet got a good one there. Thanks, Mehmet. I would not have remembered it was for free. If you are into wargames, "Armored Brigade" is also completely free. How is ArmA 2 doing for you? I'll give both those other games a go. as for Arma 2 so far so good. I will need to change a few of the sensitivity settings because I lack a joystick and have to play with a mouse, but apart from that its fine. Are you planning on getting Arma 3? The alpha is out now and during the alpha stage the game is selling at a reduced price. I am really impressed by how much it has already improved over Arma 2, especially in controls, UI and animations. Yes. I'm procrastinating a bit. I fear being disappointed. Everything looks so futuristic! I would have preferred ArmA 3 to go back in time, if not Korea than Vietnam. I know it is not as popular in video gaming as WW2 or present/future day, but I would have bought it. There is always hope for a mod!